At the market last week, I bought a couple of beautiful portobello mushrooms, even though I had no idea what to do with them. The mushrooms were more than four inches in diameter, big enough to use as entrees. A quick peek into The Joy of Cooking indicated that they would be best if roasted. For this recipe, I used our old toaster oven. I didn't want to heat up the big oven (and heat up the entire kitchen as a result) for such a small project. My first step was to preheat the toaster oven to 400. I carefully wiped off the mushrooms with a damp paper towel and then dried them. (According to the cookbook, it is best to clean mushrooms by brushing or wiping, or with a very quick rinse if necessary. They will lose their flavor if they absorb water.) Next, I removed the stems. I placed the mushrooms, convex side up, on a piece of aluminum foil and brushed them with olive oil. I let them roast in the oven for about 7 minutes. In the meantime, I cooked the bacon in a small skillet. Using tongs, I turned the mushrooms over and brushed the interior with more olive oil. I let them roast for another 6 minutes. I drained the cooked bacon and patted it with paper towels to remove the excess grease. Then I cut it into small pieces and mixed it with the shredded cheese. Next, I filled the mushroom caps with the bacon-cheese mixture and sprinkled the panko bread crumbs on top. I returned the mushrooms to the oven for about 2 minutes, just long enough for the cheese to melt. Hubby was happy with this meal, and would gladly have it again. For us, the stuffed mushrooms were a complete meal, but if we had wanted more, a small salad or any green vegetable would have made a suitable side dish. I included the breadcrumbs to add some additional texture. But I just didn't use enough crumbs; they vanished into the cheese. The bacon provided plenty of crunch, so next time I'll omit the crumbs. If I wanted to try them again, I'd use at least four times as much. Instead of discarding the mushroom stems, as I did, I would dice them and include them in the filling. The mushrooms were tasty, but they would probably be even better with some seasoning. I would try adding black pepper or garlic powder before roasting them. Diced heirloom tomatoes would be a delicious addition to the filling. With the inclusion of tomatoes and diced mushroom stems, it's easy to imagine a meatless version of this dish. Experimenting in the kitchen is a fun way to add to your cooking repertoire. If you can imagine it, you can do it. 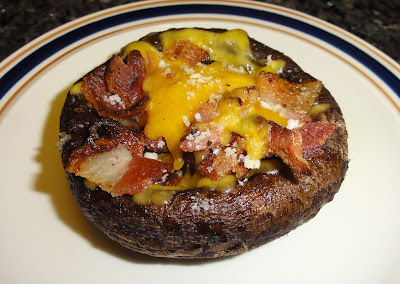 I took my own advice and made changes in the recipe, chopping up the mushroom stems with some little heirloom tomatoes for the filling, keeping the bacon and cheese, and adding garlic and pepper. These changes really improved the dish, and my husband gave it a huge thumbs up. Nature's PIZZA crust = portobellos! Yes, they do look like little pizzas, and you can top them the same way.